The Jak Wicker Side Table in java black suggests structure and ease in its quality of design, bringing the guise of sophistication and playfulness to your space. Made from synthetic outdoor wicker, this accent table is suitable for both indoor and outdoor use. Lightweight and durable, the tightly woven wicker creates a standout piece. The hourglass appearance of the Jak Wicker Side Table makes for a decorative entryway addition or pairs appropriately alongside any of our outdoor furniture sets. This side table looks wonderful in a variety of settings; whether one wants to dazzle guests upon arrival to your home or create a comforting ambiance within an outdoor space, these tables are sure to elevate your space. Call us today and place your order! Circular and triangular, linear and round; the Jak Wicker Side Table puts the finishing touches on indoor and outdoor spaces alike. With the bold geometric shape and the rich tone and woven texture, this piece adds the right amount of understated drama that is sure to leave your guests inspired. 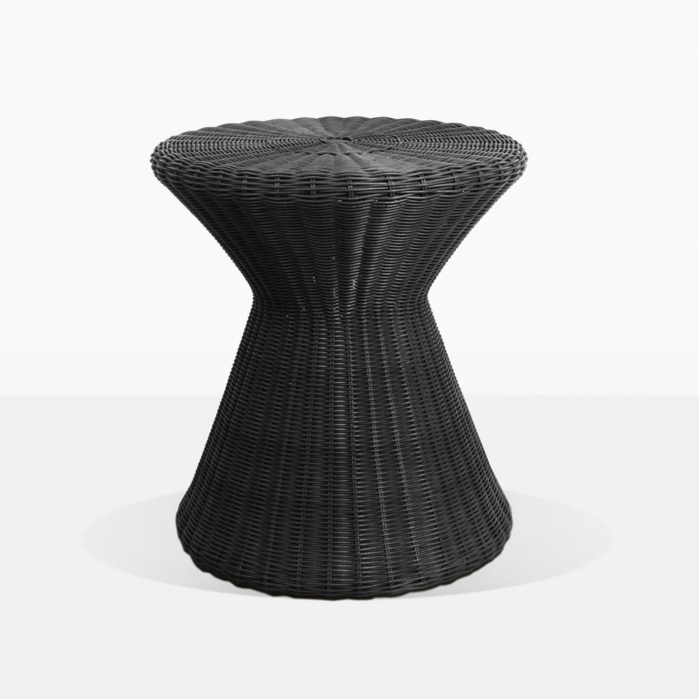 Made of synthetic wicker materials, the Jak Wicker Side Table is resistant to the sun’s UV rays and water. Our synthetic outdoor wicker is made from high-end through-dyed, durable resins and textured to resemble natural fibers while maintaining all the benefits of synthetic outdoor wicker. Exercise your creativity by making a statement. The Jak Wicker Side Table works great when there are multiples or mixed and matched with any of our other side table designs. Create a unified look or bring variety to your space. There is no limit to your creativity!